Remembering a Hero, 15 Years After 9/11 ‘With this bandanna,’ Welles Crowther said, ‘I’m gonna change the world.’ And he did. And I think about Welles Crowther, the man in the red bandanna. He was 24, from Nyack, N.Y. He played lacrosse at Boston College, graduated and got an internship at Sandler O’Neill, the investment bank. In two years he was a junior associate on the trading desk. He worked in the south tower of the World Trade Center, on the 104th floor. When United Flight 175 hit that tower at 9:03 a.m., it came in at a tilt, ripping through floors 78 through 84. Many of those who never got out were on those floors, or the ones above. Welles Crowther had already called his mother, Alison, and left a voicemail: “I want you to know that I’m OK.” Only one stairwell was clear. He found it. Most people would have run for their lives, but he started running for everyone else’s. 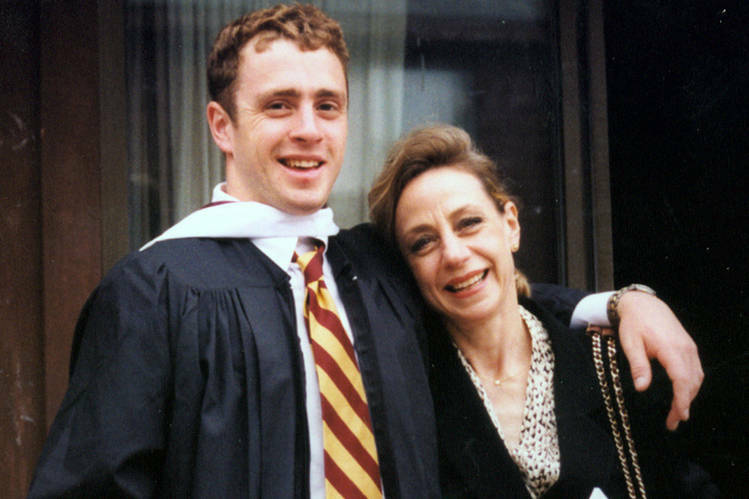 Welles Crowther and his mother, Alison, in 1999. Welles was beloved—bright, joyous, grounded. Family was everything to him. He idolized his father, Jefferson, a banker and volunteer fireman. They went to the firehouse together when Welles was a child. Welles would clean the trucks, getting in close where no one else could fit. One Sunday when Welles was 7 or 8 his mother dressed him for church in his first suit. His father had a white handkerchief in his breast pocket. Could he have one? Jefferson put one in Welles’s front pocket and then took a colored one and put it in Welles’s back pocket. One’s for show, he said, the other’s for blow. “There was something she heard in the voice, an authority, compelling her to follow,” Mr. Rinaldi writes. Ms. Young stood, and followed. She saw that the man was carrying a woman. Eighteen floors down the air began to clear. He gently placed the woman down and told them both to continue walking down. Then he turned and went back upstairs to help others. Judy Wein of Aon Corporation had also been in the 78th floor. She too was badly injured and she too heard the voice: “Everyone who can stand now, stand now. If you can help others, do so.” He guided her and others to the stairwell. Apparently Welles kept leading people down from the top floors to the lower ones, where they could make their way out. Then he’d go up to find more. No one knows how many. The fire department credits him with five saved lives. He never made it home. His family hoped, grieved, filled out forms. On the Friday after 9/11 Alison stood up from her desk and suddenly she knew Welles was there, right behind her. She could feel his energy, his force; it was him. She didn’t turn. She just said: Thank you. She knew he was saying he was OK. After that she didn’t dare hope he’d be found alive because she knew he wouldn’t. They found him six months later, in the lobby of the south tower. He’d made it all the way down. He was found in an area with many firefighters’ remains. It had been the FDNY command post. It was where assistant fire chief Donald Burns was found. He and his men had probably helped evacuate thousands. Welles could have left and saved his own life—they all could have. But they’d all stayed. “He was helping,” said Alison. The Crowthers never knew what he’d done until Memorial Day weekend 2002. The New York Times carried a minute-by-minute report of what happened in the towers after the planes hit. Near the end it said: “A mysterious man appeared at one point, his mouth and nose covered with a red handkerchief.” It mentioned Ms. Young and Ms. Wein. The Crowthers sent them pictures of Welles. As a child, Welles Crowther had wanted to be a fireman. Few knew he’d decided to apply for the FDNY while he was still at Sandler. After his father found his application the department did something it had done only once in the 141 years since its founding. It made Welles an honorary member. It wasn’t us, she was saying, it was him. It was Welles. The way I see it, courage comes from love. There’s a big unseen current of love that hums through the world, and some plug into it more than others, more deeply and surely, and they get more power from it. And it fills them with courage. It makes everything possible. People see the fallen, beat-up world around them and ask: What can I do? Maybe: Be like Welles Crowther. Take your bandanna, change the world.